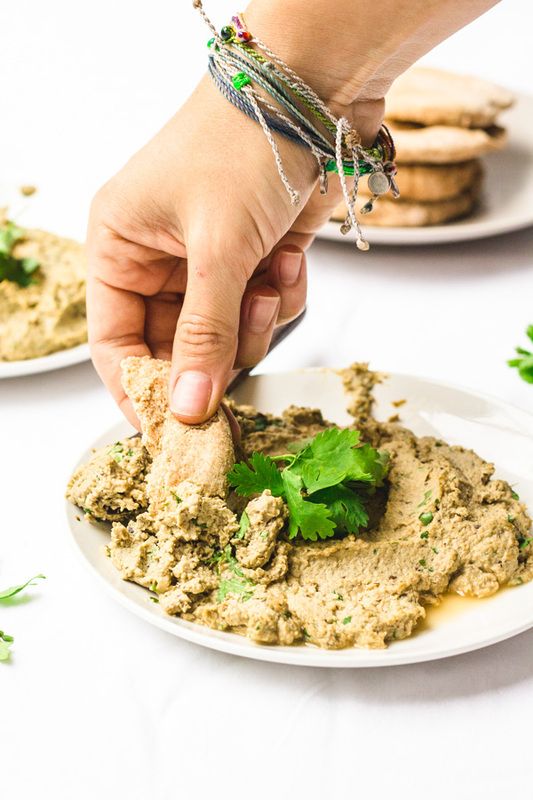 A quick and easy vegan babaganoush recipe made without oil and roasted eggplant. Babaganoush - the first time I heard this word, was recently. Very recently. In south Florida one does not eat babaganoush. Maybeeee hummus, if that. But not babaganoush. And what a shame that is because it is AMAZING!!! I am totally hooked and so is my boyfriend.... who has literally planted eggplants in our garden just to ensure that we continue eating this delicious dip (or spread?) for many more months to come. This is a very basic recipe, but the thing is that traditional babaganoush itself is very basic. If you've got eggplant, garlic, tahini, and lemon juice - you've got yourself some babaganoush. The part that takes the longest is prepping the eggplant. You need to salt it, let it sit so that it can release some of its extra water, wipe it down a bit and then roast it. Traditional recipes call for roasting the eggplant in the oven for about 40 to 50 minutes until soft and golden brown. However, that is a LONG time and when you're craving babaganoush you want it NOW. So, lucky for us - minimalistbaker aka genius in the kitchen - came up with a quick alternative to that, and instead experimented with using the BROIL setting to roast these babies up in, like, 10 minutes. Yes, now we're talking! If using the broil method - stay near your oven at all times and keep an eye on the eggplant. In my oven, it takes 10 minutes total, five on one side, five on the other and that is using the LOW broil setting. Some ovens do not have medium/low setting so if using HIGH please note the roasting time will be much shorter. I don't use refined oil in my recipes so this babaganoush is of course oil free. Make sure to coat the raw eggplants with vegetable broth before roasting - this will ensure a nice soft and golden roasted eggplant that won't stick to the aluminum foil. You can enjoy babaganoush as a dip or as a spread. It tastes delicious with pita bread, crackers, and even raw veggies such as carrots and bell peppers. Serve it up at your next party or get-together as an appetizer or as a side to another main dish. 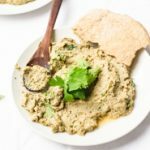 Want to see more vegan dips or spreads? Check out this tasty (and pretty) roasted beet hummus, or my favorite carrot garlic hummus! An easy babaganoush recipe that is quick, tasty and refined oil free. Begin by peeling eggplant and then slicing it into rounds that are around 1/4 inch thick. You can also opt to remove the skins later on but I found that peeling it before hand is much easier. Place cut eggplant rounds on a colander or paper towels and sprinkle a tiny bit of salt (enough to coat all eggplant). Let sit for 10 minutes so that the eggplant can release excess water. After 10 minutes, lightly pat the eggplant with paper towels to dry. Arrange eggplant rounds on a baking dish lined with aluminum foil. Sprinkle enough vegetable broth to coat all eggplant and sprinkle a bit more salt. Roast in oven using the ‘broil’ setting – If your oven has the option for low broil, I recommend that you use that one instead of high. With LOW broil – eggplant will roast in about 10 minutes. Make sure to flip the rounds halfway through (within the 5 minute mark). Eggplant rounds are ready once they are soft and golden. Remember if using HIGH broil, the eggplants will be ready much quicker. Keep an eye on them! Remove eggplant from oven and let cool down for a few minutes before transferring to food processor. If you haven’t peeled the eggplant yet – now is the time to remove the skins. The skins should peel away easily, but I still find it easier to peel the eggplant before roasting it. Add garlic clove, lemon juice, tahini butter and eggplant to food processor and process until smooth. Add handful of cilantro last and pulse a few times. If needed add another pinch of salt. I usually don’t add any more salt at this point but feel free to add more. Top with some more lemon juice, chopped cilantro, and serve with pita chips, crackers, or enjoy by the spoonful! Most recipes call for peeling the eggplant after it has roasted, and even though the skin does come off easily this way, I have found it to be much easier to simply peel the eggplant before cutting/roasting.